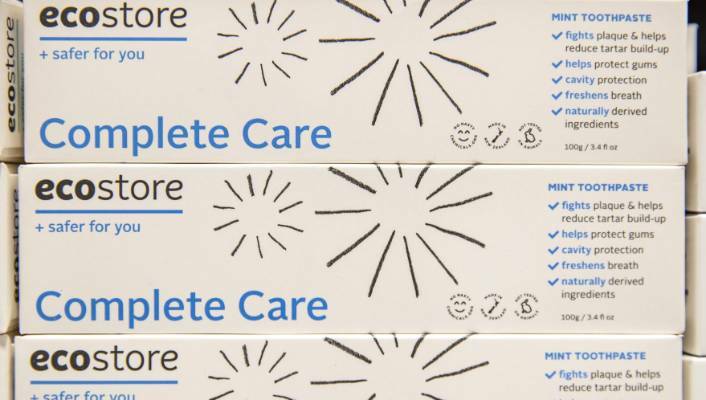 DAVID WALKER/STUFF – The complaint was in relation to marketing for Ecostore’s Complete Care toothpaste. Ecostore has removed anti-fluoride marketing from its website after a complaint to the advertising watchdog accused the company of “scaremongering”. In July Ecostore launched a range of fluoride-free natural toothpaste, which included three products. Marketing relating to one of the products, Ecostore Complete Care toothpaste, triggered a complaint to the Advertising Standards Authority (ASA) for unsubstantiated claims and fluoride “scaremongering”. The complaint from a C Atkinson said an advertisement for the toothpaste on the Ecostore website included an information page on sodium fluoride which labelled the material as “nasty”. In relation to sodium fluoride, the page said: “This ingredient has been classified as hazardous to health, and is not used in Ecostore products”. It also said that sodium fluoride was known as a skin, eye and lung irritant, Atkinson said. Atkinson said it was concerning that Ecostore was misrepresenting the use of fluoride additives and thus scaremongering. It also failed to substantiate a claim that its toothpastes “fight cavities”. “By listing this information page under the ingredients section, it is likely to give consumers the impression that toothpastes containing sodium fluoride are unsafe and dangerous for consumers,” Atkinson said. It also provided no information about the positive effects fluoride had on dental health, Atkinson said. Furthermore, Ecostore’s claims its products helped reduce plaque, prevent tartar build-up and fight cavities were not substantiated, Atkinson said. Ecostore research and development manager Huia Iti said it had no intention to scaremonger. The page had been removed based on the ASA process and references to fluoride had been amended to only advise of its absence in its products, Iti said. “Fluoride free” remains on its toothpaste packs, Iti said. The authority acknowledged Ecostore made changes to the website and, after receiving the complaint, removing references which were of concern. Because Ecostore cooperated and took self-regulatory action in amending the ad, the authority ruled that the matter was settled. On its website Ecostore still features information about fluoride. It says fluoride protects teeth and strengthens and repairs enamel through “remineralisation” of weak spots. It says Ecostore does not use fluoride because it is a “toxic poison in high doses, and while most toothpastes use a small dose, some consumers are worried about the risk of fluoride poisoning from ingesting fluoride toothpaste”. A rise in the number of fluoride-free toothpastes on the market has caused concern amongst some in the dental industry. The Dental Association said all toothpastes should contain fluoride. Canterbury District Health Board community dental service clinical director Martin Lee said fluoride worked to strengthen tooth enamel “by a factor of 10” against acid formed by oral bacteria. Ecostore also drew criticism on social media about its toothpaste, with customers asking for a fluoride-free option and expressing disappointment in Ecostore for fluoride “scaremongering”. Ecostore defended its fluoride-free position on social media by telling customers that because fluoride was produced through a chemical process, it was not a sustainable raw material.